Dr Subhash Gupta is heading to Karachi for his second visit in three months. Like last time, he is expected to perform 3-4 transplants and train local doctors. 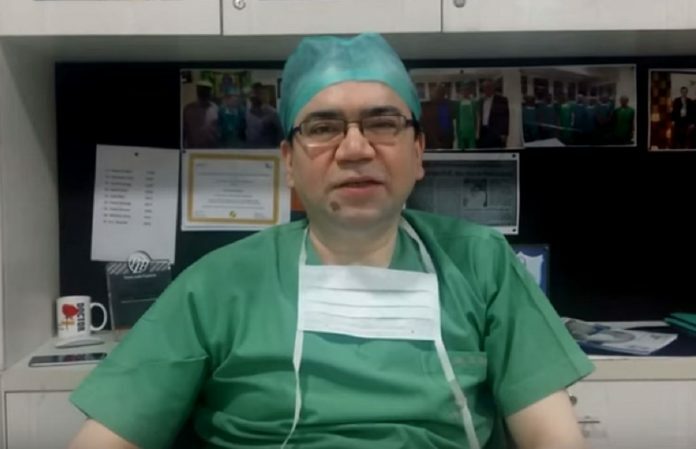 New Delhi: Indian liver transplant surgeon Dr Subhash Gupta is set to visit Karachi with his team this month to perform liver transplants at the Dow University of Health Sciences (DUHS). Gupta, chairman of the Max Centre for Liver and Biliary Sciences, is expected to perform “three to four liver transplant surgeries at the Ojha campus of DUHS”, according an announcement made by the vice-chancellor of the university, Prof. Saeed Quraishy, at a medical conference organised by the Pak GI and Liver Diseases Society (PGLDS). The senior Indian surgeon will also be training a team of Pakistani surgeons to impart skills to perform complicated surgery locally without foreign supervision. This will be Gupta’s second visit to the DUHS in three months – he also went in December 2017 and performed three transplants. On that visit, he had received shields of appreciation from the governor of Sindh, Dr Ishratul Ibad. Dr Gupta is credited globally for his work in the field of liver transplantation. He pioneered the development of Living Donor Liver Transplant (LDLT) in India, and was recognised for successfully performing 300 LDLTs in 2013 at Indraprastha Apollo Hospital. He also received the Medical Council of India’s Dr B.C. Roy Award by in 2016. Professor Quraishy stressed on the need to control Hepatitis C in Pakistan, as it is still claiming many lives. He said Karachi’s health sector faces a lack of trained human resources, due to which a large number of patients have to go out of the country for liver transplants, according to a report in the Express Tribune newspaper. Around 700-800 Pakistani patients go abroad for liver transplants every year, at a total cost of up to $4 million, the Dawn newspaper quoted liver transplant experts at Islamabad’s Shifa International Hospitals as saying. More than 500 Pakistanis had received liver transplants in India until 2015, mostly at private hospitals like New Delhi’s Indraprastha Apollo Hospital, where a liver transplant costs between Rs 20 to 32 lakh, added to which is the cost of travelling and stay. In addition, Indian doctors have also set up liver transplant camps across the border in the past. In 2015, a ‘peace clinic’ programme was set up between Karachi’s Dr Ziauddin Hospital and Gurugram’s Medanta, where Dr Arvinder Singh Soin conducted a camp for liver transplant patients.